Opened on the occasion of of World Whisky Day, celebrating drams around the world on May 18th this year. I purchased this duty free on a cruise ship coming back from Alaska, and also bought it without having a single taste. 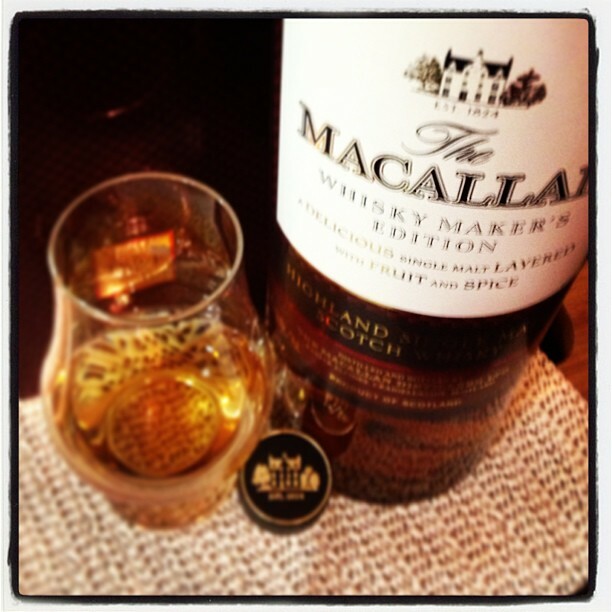 But with the limited selection available, it was my choice since I have enjoyed the other Macallans I have tried. And if by chance I did not enjoy it, I was sure that I would be able to find people to share it with. WOW! I was not disappointed at all. Rich autumn fruit aromas, almost rum raisin, clove, cinnamon and spice. Soft and sherry spice on the palate, surprising white chocolate on the back palate; long lingering fruity finish. A few drops of water really opened it up and brought out the creaminess on the palate, fruit and spice, and the toffee really comes through. A very special dram and one I am going to really enjoy again.